Chapel Street, Oakthorpe - Mark Webster & Co.
Having a wooden glazed entrance door, central heating radiator, door to an understairs storage cupboard, stairs to the first floor accommodation and doors to the lounge, study/music room and day room. A superb relaxing room with the main focal point being a stunning exposed brick fireplace with a feature stone fire surround and tiled hearth. Other features include the exposed ceiling beams, wall lights, double glazed window to front aspect with fitted French shutters, radiator and an archway that links up to the large dining room. Having exposed ceiling beams, radiator, door to kitchen, double doors to the day room and a double glazed side window with fitted French shutters. Double glazed window to front aspect, radiator and an opening and steps down to the family room. Having double glazed windows to front and rear aspects, radiator, recessed ceiling down lighters, French doors to the rear garden with matching side panels and fitted shelving/entertainment unit to the middle wall. Fitted with a range of bespoke base and drawer units with matching wall cupboards, Corian work surfaces, inset ceramic Belfast style sink, AGA oven with a six-ring gas hob and an extractor hood overhead, centre island that includes an integral microwave with breakfast bar, space for a fridge freezer, built in dishwasher, tiled floor, tiled splashbacks, exposed ceiling beam, side glazed entrance door, two double glazed windows to the rear and side, video/audio security link to the electric front gates, door to the day room and further door to the utility area. A superb room that over looks the well maintained gardens and swimming pool having a tiled floor, two radiators, double doors leading out to the patio and two UPVC double glazed side windows. Having a fitted base unit, Corian work surface, inset ceramic sink and drainer, space and plumbing for a washing machine, tiled floor and splashbacks, radiator, double glazed window to rear aspect and a door to the guest WC. Having a low level WC, wall mounted wash basin, tiled floor and an opaque double glazed window to rear aspect. Having a door giving access to the stairs leading off to the second floor landing and further doors to all the first floor accommodation. Having double opening doors to a useful storage cupboard, door to the en-suite bathroom and further door to the master bedroom suite. Having a useful walk-in recessed tiled shower cubicle with a wall-mounted shower overhead, radiator, a door to the dressing room, two double glazed windows to side and rear aspects with fitted French shutters and a door to the good sized dressing room. Having a wide range of hanging and shelving space, chrome ladder towel rail, exposed beam and a double glazed window to rear aspect with fitted French shutters. Having a large panelled air bath with a chrome mixer tap with shower head attachment, vanity wash hand basin with storage under, low level WC, tiled floor, tiled walls, Corian vanity work surface, exposed beam, chrome ladder towel rail and a double glazed window to side aspect. A good sized double room having a radiator, double glazed window to front aspect and a door to the walk in wardrobe. With built-in shelving, light and a double glazed window to front aspect. Another generous sized double room having a radiator, built-in storage cupboard and a double glazed window to side aspect. Double room with a built-in wardrobe, radiator, exposed beams and a double glazed window to front aspect. Having a fully tiled walk-in shower cubicle with a wall-mounted shower overhead, wash hand basin, low level WC, chrome ladder towel rail, tiled walls, tiled floor and a double glazed window to side aspect. An upper landing area with doors to the fifth and sixth double bedrooms. A second floor double room having a radiator, exposed beams and a double glazed window to front aspect. A further second floor double room having built-in wardrobes, radiator and a double glazed window to front aspect. 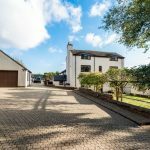 This substantial property is partial hidden from the lane by a high brick wall with vehicular access through the remotely-controlled electric security gates giving access to the long cobbled drive. There is a large front lawn with decorative planted borders and steps to the block paved planted garden. There is a variety of planted shrubs and mature trees with side access leading to the heated swimming pool area with brick built changing rooms with shower, brick built pump room and a large raised paved patio/sun terrace. 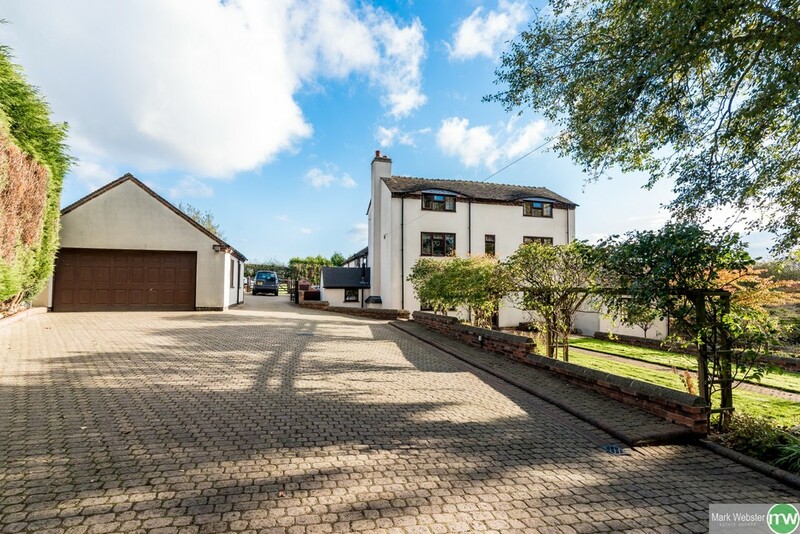 Located to the rear of the property is a good sized paddock that offers excellent potential for further development (subject to relevant planning consent). Over all the grounds stand in approximately 1.3 acres with parking for several vehicles. Having an up and over electric door, side entrance door, power and light. Having a Worcester floor-standing boiler, unvented indirect cylinder, tiled floor, fitted storage cupboards, space for a tumble dryer and a double glazed window to front aspect.